I had lunch today at Vios Cafe & Marketplace with two good friends. This was my first visit to Vios and it certainly won't be my last. Vios is a traditional Greek cafe. When you first walk into Vios you notice right away that it is a very family friendly place to eat. Pretty much every table had some young kids, and there is a little kids play area in the back of the cafe. It was nice to see so many families out to lunch with their kids. Orders are placed at the counter and the food is brought out to you. I decided to go with the Chicken Souvlaki. 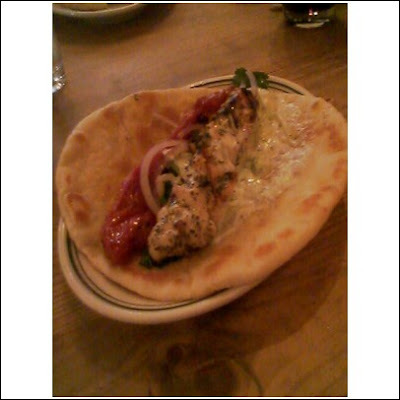 The chicken is marinated in oregano, lemon & garlic and served on a pita with tomato, onions and tzatziki. Vios has some of the best tzatziki I've ever tasted. I also had some chocolate cake and a vanilla latte. Both were very good! I give Vios Cafe & Marketplace 4 out of 5 lattes.